An investigation that set out to resolve some of the uncertainty in the sources and quantities of pollutants reaching Antarctica has produced a new experimental technique to identify and characterise recently terrestrially-influenced air reaching Antarctica. The study, which was published in the Journal of Geophysical Research: Atmospheres, was undertaken in collaboration with the Korea Polar Research Institute, University of Bologna, and the Brazilian National Institute of Space Research, and was funded in part by the Australia-Korea Foundation. Antarctic research provides opportunities to understand long term changes in global climate and gain a better understanding atmospheric circulation at hemispheric and global scales. 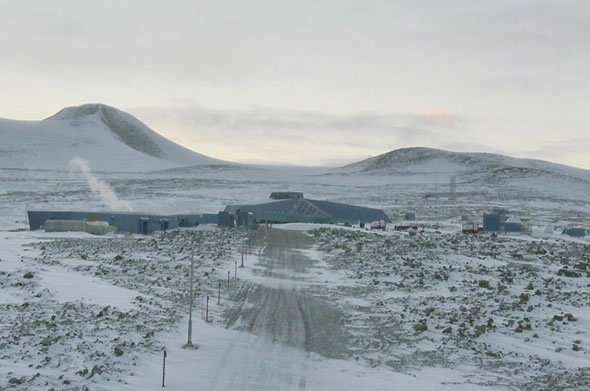 The study relied on radon measurements collected using dual-flow-loop two-filter radon detectors, made and installed by ANSTO, that were located at two Korean stations in Antarctica. The detectors are considered the best in the world. Radon provides unambiguous evidence of terrestrial influences on air masses within the past two to three weeks. "Our colleagues at the Korean Polar Research Institute wanted to know more about pollution reaching Antarctica," said lead author Dr. Scott Chambers (below right). "They were looking for the types of pollution that get there, where it comes from, how it is diluted on the journey and how much is lost through mixing and diffusion." The Korea Polar Research Institute operates two bases where they measure the concentrations of radon, trace gases, and aerosols, the new Jang Bogo station at Terra Nova Bay at a latitude of 75 degrees south, and at King Sejong Station on King George Island at 62 degrees south. Radon concentrations from Jang Bogo station were subject to katabatic winds (fed by tropospheric subsidence), as well as emissions from the Transantarctic Mountains and nearby volcanoes, while the radon concentrations from King Sejong station were more characteristic of "baseline" marine conditions. This difference led Chambers and his colleagues to investigate further to ensure the effectiveness of using radon as an atmospheric tracer of recent terrestrial influence. "I was curious as to how much variability there was in anthropogenic pollutants reaching Antarctica through different parts of the atmosphere." Atmospheric transport of pollution to Antarctica takes place in two layers:the marine boundary layer and troposphere; each of which are influenced by different processes. Synoptic weather events transport much pollution within the boundary layer, which extends from one to one and a half kilometres over land and 400 to 600 metres over the ocean. Convection events and cold fronts, on the other hand, can lift pollutants from near the surface into the troposphere, where they can be transported by other mechanisms. In extreme cases pollution can also reach the stratosphere. Most of the pollution that reaches Antarctica either within the marine boundary layer or troposphere comes from southern hemisphere regions. However, a small percentage of northern hemisphere pollutants also reach Antarctica following transport within the stratosphere. Radon readings in Antarctica can be complicated by katabatic flows that are caused by the combined influences of cold surface temperatures and high elevation of the continental land mass and ice sheet. Jang Bogo station, in Terra Nova Bay, is situated in a coastal location where it is subject to katabatic flows. Near this site the terrain elevation changes from sea level to over 3,000 metres over a distance of less than 100 kilometres. On the lee side of the mountain range, a stream of very cold air, which has cooled over the elevated frozen plateau of interior East Antarctica comes flying down. "If you are sucking air from the Antarctic shelf, it has to be replaced from somewhere and it comes from the troposphere or the stratosphere," said Chambers. "I was looking at downslope wind events and noticed that the katabatic flows in particular, windy periods which happen between midnight and sunrise, are both much colder and drier than air that has been synoptically forced over the Antarctic continent." Chambers surmised that if you measure at coastal locations of East Antarctica, where the interior has high elevation, humidity observations can be used to separate boundary layer and tropospheric air masses, and radon observations can then be used to "sort" these categories according to the time since last land contact, where most pollution sources reside. "The meteorological information can distinguish between the pollution transport mechanisms, and the radon observations can be used to rank each air parcel with a "pollution potential" – the time since last land contact." "Although not all air that has been over the ocean for a long time will be clean, prior studies have shown that air that has been away from land the longest with (the lowest radon concentrations), provides the best estimates of 'baseline' (clean air) conditions for global greenhouse gas investigations." "This newfound experimental ability to simply identify tropospheric subsidence events, and subsequently characterise their extent of recent land contact, provides crucial information about southern hemisphere atmospheric transport mechanisms and timescales. The fidelity of global climate models dictates the accuracy of our climate predictions. It is therefore very important to continually improve the parameters that describe the system and determine their transport and mixing. The cost and significant logistical burden associated with making measurements in Antarctica and the remote Southern Ocean limits the number of observations that can be made in this important part of the world. It is also important to leave the region as pristine as possible. We need to work smarter, not harder, with the limited number observational stations available to make sure we can get as much value out of them as we can. Natural radioactive tracers such as Radon-222 are an important part of the necessary toolkit for this task, and with this ANSTO is currently leading the way," said Chambers. While Chambers' initial study was focussed only on radon measurements, he has since demonstrated that the analysis technique can be applied to characterise concentrations of other gases, such as methane, CO2, ozone or mercury, separately within the Antarctic troposphere and marine boundary layer. "Colleagues from Europe and the United States have offered data sets because they are interested in evaluating the influence of different transport processes and better constraining chemical cycling in coastal Antarctica and the Antarctic plateau."